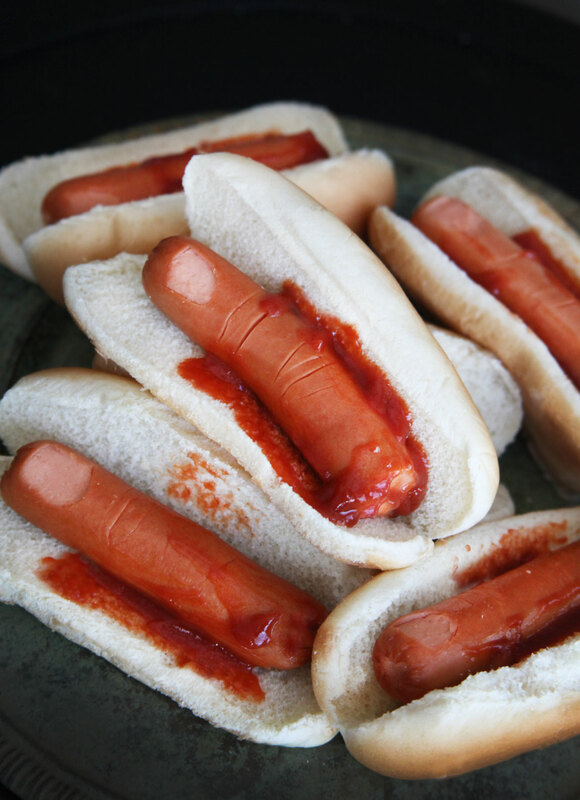 HALLOWEEN FOOD – Severed Fingers In A Bun! Yes, yes, I know it’s gross… but it’s Halloween… right??? And as your kids will get older, fun cupcakes, gummy worms, and cute Halloween popsicles, just won’t do anymore! This year, my 10 year old and I came up with “Severed fingers in a bun”. We saw so many “finger foods” on Pinterest, that we thought we would try something ourselves. If this is something you think your kids or teenagers would like for Halloween, it’s probably the easiest thing we’ve ever done! Just prepare hot dogs as you normally would, then cut out s thin section to look like a nail bed. Then, make a few cuts with a knife to represent the knuckles. Last but not least, place the hot dogs in a bun already doused with ketchup. It’s even grosser if you decide to grill the hot dogs… need I say more? This entry was posted on Friday, October 11th, 2013 at 4:18 pm	and is filed under Halloween, Recipes, Uncategorized.